My first book, Old Lady on the Trail, is live on Amazon today! Adventure on National Scenic Trails does not need to end when one is old. Not beginning long distance hiking until age 60, Mary takes you on trail journeys to experience encounters with the beauty of wilderness from the Eastern ranges of the Appalachian Trail, the challenges of desert, snow, granite and thick forests of the Pacific Crest Trail, and the rugged and the remote grandeur of the Continental Divide Trail. Along the way you are introduced to the Trail Community. Hikers of many ages and walks of life labeled with colorful monikers called trail names and trail angels, planned and total surprises, grace her journey. Bears, moose, deer, coyotes, turkey vultures, hawks, eagles, owls, pronghorn, and endless supplies of squirrels and chipmunks share the world through which she walked. 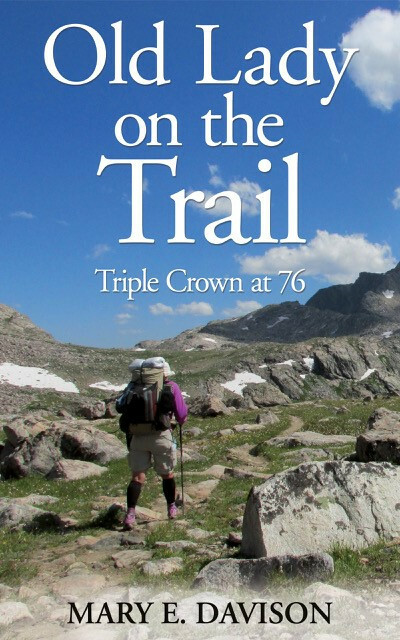 Everyday challenges of completing seemingly endless miles, encountering new adventures, sometimes with friends and much of the time solo, brought Mary to the first pages of this book on a glorious day sighting two grizzly bears and completing long distance hiking’s Triple Crown at age 76. Throughout this inspirational journey, Mary shares the perspective of an aging adult. Challenges of failing body parts add drama and obstacles to be overcome like rocks in the trail or adapted to like the trails that wind slowly up steep mountains. Come along dear readers and experience long trails with the Old Lady on The Trail.